Did you know deviled eggs (or a version of) have been traced back to Ancient Rome? The Ancient History of deviled eggs shows that they began to appear in places such as Spain and Europe. But that doesn't explain why they are "deviled." At some point, "deviled" was referenced when talking about making food spicy. Of course, there were other less satanic sounding names people liked to use such as "salad eggs." Nowadays, basic deviled eggs are usually made with mayonnaise and mustard and paprika such as this recipe. What makes this recipe different, however, is the incorporation of herbs. Specifically, we are talking about chives. Chives, often confused or substituted with green onions or scallions, are simply an herb that gives and onion-garlic flavor. If you aren't a chive fanatic, try cutting some fresh dill weed atop the deviled eggs as an alternative. They are also a beautiful green herb that brings a strong delicious flavor. 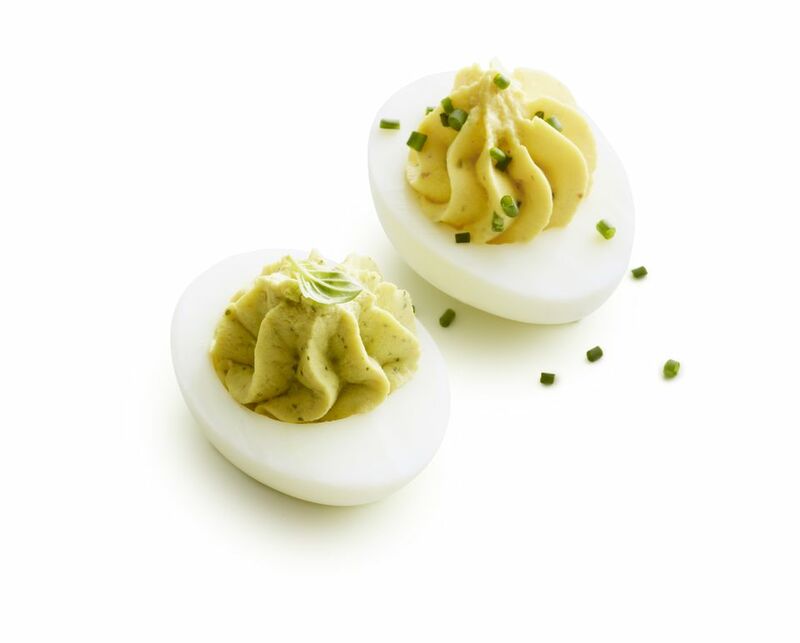 As easy and elegant as these deviled eggs are, they also make a favorite to-go snack and are perfect for the holidays. Chives bring an extra element of flavor in such a big yet easy way. Peel the eggs and halve lengthwise. Gently remove the yolks and place in a medium bowl. Add 1/4 cup of mayonnaise to the yolks and mash with a fork or wire whisk until smooth. (You can also use a handheld blender for this.) Add additional mayonnaise to taste and to achieve a creamier texture, if desired. Stir in the mustard and chives, mixing until well incorporated. Spoon the yolks into the egg white halves and dust with paprika. Or, for a fancier presentation, place the yolk mixture into a pastry bag, and pipe into the egg whites, before garnishing with paprika. Refrigerate covered, allowing to cool until ready to serve.